Each bottle contains 100 gelatin capsules of 500 mg Turmeric, well known all over the world as a culinary spice, but may also be used as a nutritional supplement. Guaranteed pure and potent from the Self Health Resource Center. No flow agents, no stearate, no binders, no coatings, no dye. Suggested Use: Persons 12 or more years of age, take up to 2 capsules 3 times daily or as directed by a health professional. Expect yellow stool. 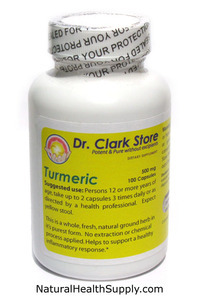 Turmeric is a whole, fresh, natural ground herb in its purest form. No extraction or chemical process applied. Warning: If you are pregnant, lactating, or have any history of liver, gall bladder or gastrointestinal problems, please consult a health professional prior to use. Store this product in a cool dry place. Keep out of reach of children.